James Savelli, a Chartered Accountant since 2014, commenced his association with MARMER PENNER INC. in the same year. 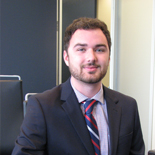 Previously, James practiced in the areas of audit and income tax at a mid-size firm in the GTA region. He graduated from Wilfrid Laurier University in 2011, with a Bachelor of Business Administration degree specializing in accounting. James obtained his designation as a Chartered Business Valuator in 2016.